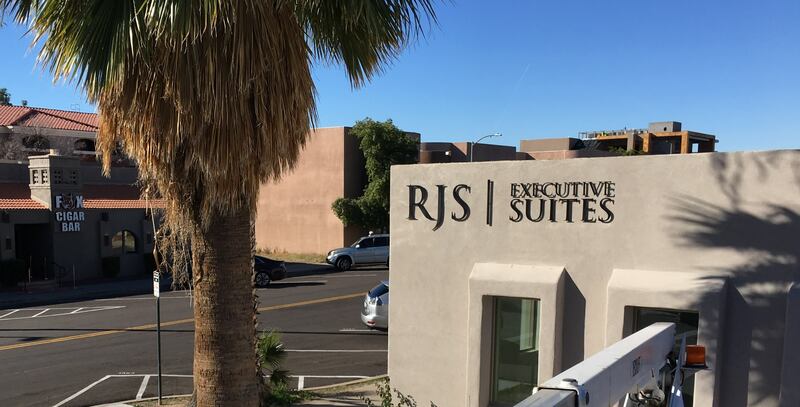 RJS Executive Suites in Scottsdale has 12 private offices, 1 shared conference room, 2 bathrooms, a break area / waiting room with TV and couch, TV in each suite, wifi included, and much more. See what is available below by clicking on the office suite links. Located in a private section of the building, Suite #105 features 130 sq/ft, one east facing window, one private parking spot located on the west side of the building, private 24 hr keypad access, free wifi, desk+chair, 32″ Roku mounted TV, and is conveniently located near to the front entrance and the conference room. When combined with the 185 sq/ft conference room, 2 bathrooms, and break / waiting area, your total usable area is roughly 530 usable sq/ft. Suite #110 features 110 sq/ft, one east facing window, private 24 hr keypad access, one reserved parking spot on the west side of the building, a 32″ mounted Roku TV, free wifi, desk+chair, and is conveniently located near to the front entrance and the conference room. When combined with the 185 sq/ft conference room, 2 bathrooms, and break / waiting area, your total usable area is roughly 500 usable sq/ft. 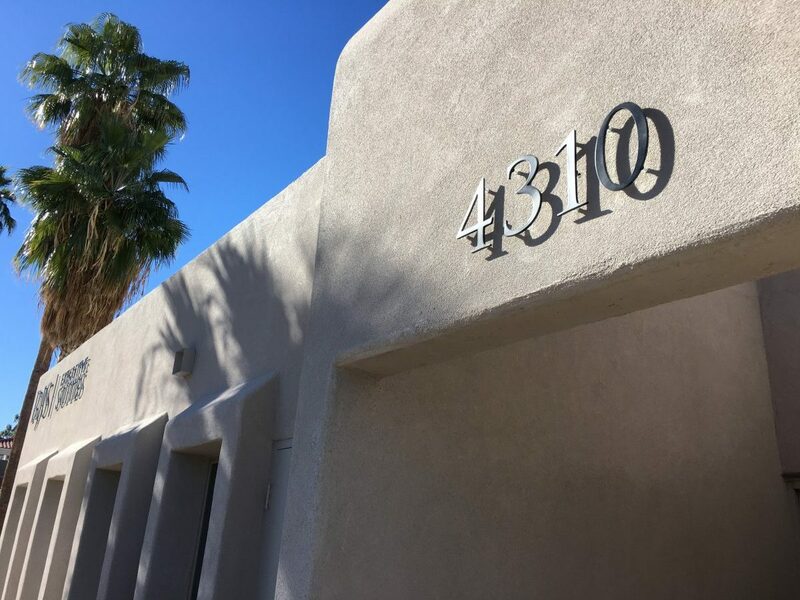 Suite #115 features 100 sq/ft, one east facing window, private 24 hr keypad access, free wifi, desk+chair, and is conveniently located near to the front entrance and the break area. When combined with the 185 sq/ft conference room, 2 bathrooms, and break / waiting area, your total usable area is roughly 500 usable sq/ft. Suite #120 features 125 sq/ft, two east facing window, desks and chairs for 1 or 2 persons, private 24 hr keypad access, free wifi, and includes reserved parking on the west side of the building. When combined with the 185 sq/ft conference room, 2 bathrooms, and break / waiting area, your total usable area is roughly 530 usable sq/ft. Suite #125 is our largest office, with over 155 sq/ft, three east and south facing window, desks and chairs for 1 or 2 persons, private 24 hr keypad access, free wifi, a 32″ Roku TV mounted and ready to use, and also includes one reserved parking spot on the west side of the building. When combined with the 185 sq/ft conference room, 2 bathrooms, and break / waiting area, your total usable area is roughly 550 usable sq/ft. Suite #130 features 100 sq/ft, one south facing window, private 24 hr keypad access, free wifi, all new premium desk+chair, a 32″ Roku TV, extra storage, and much more. When combined with the 185 sq/ft conference room, 2 bathrooms, and break / waiting area, your total usable area is roughly 510 usable sq/ft. Suite #135 features 100 sq/ft, one south facing window, private 24 hr keypad access, free wifi, all new premium desk+chair, a 32″ Roku TV, extra storage, and much more. When combined with the 185 sq/ft conference room, 2 bathrooms, and break / waiting area, your total usable area is roughly 510 usable sq/ft. Suite #140 is one of our largest office, with over 150 sq/ft, three west and south facing window, desks and chairs for 1 or 2 persons, private 24 hr keypad access, free wifi, a 32″ Roku TV mounted and ready to use, and also includes one reserved parking spot on the west side of the building. When combined with the 185 sq/ft conference room, 2 bathrooms, and break / waiting area, your total usable area is roughly 550 usable sq/ft. 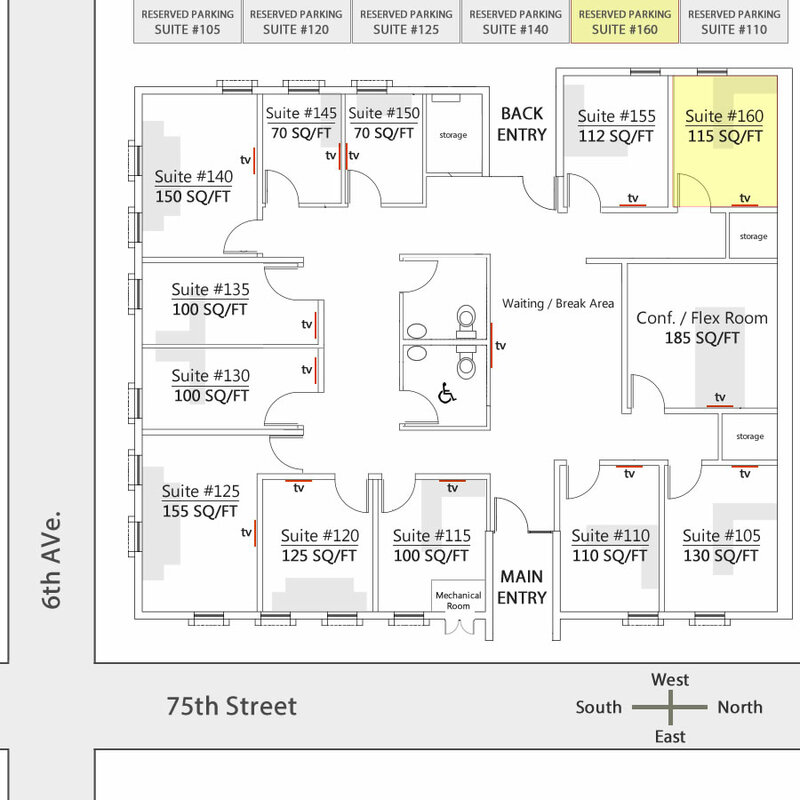 Suite #145 features 70 sq/ft, one west facing window, private 24 hr keypad access, free wifi, all new premium desk+chair, a 24″ Roku TV, and much more. When combined with the 185 sq/ft conference room, 2 bathrooms, and break / waiting area, your total usable area is roughly 475 usable sq/ft. Suite #150 features 70 sq/ft, one west facing window, private 24 hr keypad access, free wifi, all new premium desk+chair, a 24″ Roku TV, and much more. When combined with the 185 sq/ft conference room, 2 bathrooms, and break / waiting area, your total usable area is roughly 475 usable sq/ft. Suite #155 features 112 sq/ft, one west facing window, private 24 hr keypad access, free wifi, desk+chair, a 32″ Roku enabled mounted TV, and is conveniently located near to the back entrance and parking area. 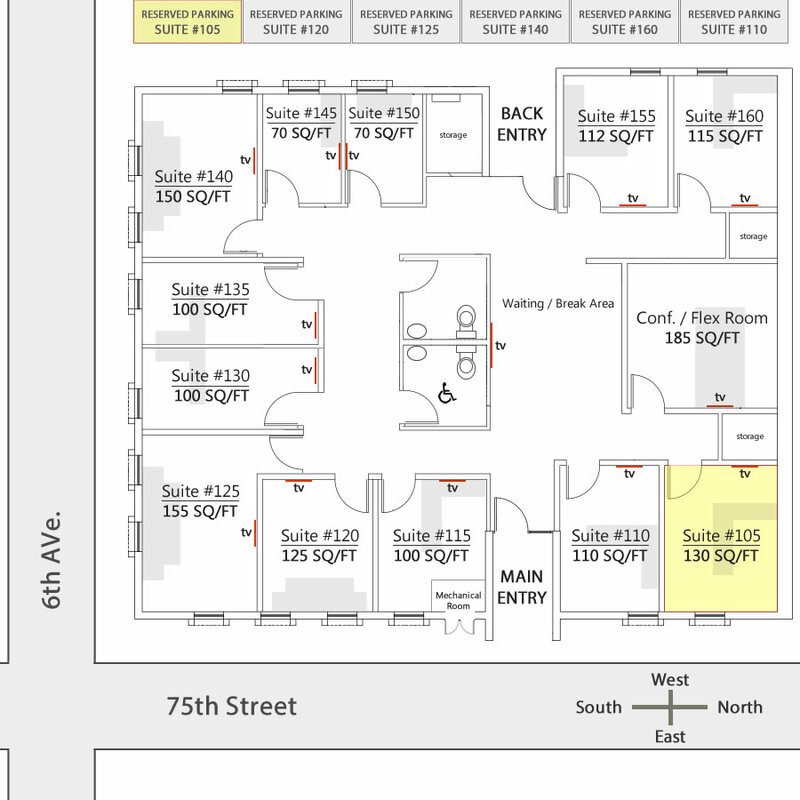 When combined with the 185 sq/ft conference room, 2 bathrooms, and break / waiting area, your total usable area is roughly 520 usable sq/ft. Located in the most private section of the building, Suite #160 features 115 sq/ft, one west facing window, private 24 hr keypad access, free wifi, desk+chair, private parking on the west side of the building, and is conveniently located near to the front entrance and the conference room. When combined with the 185 sq/ft conference room, 2 bathrooms, and break / waiting area, your total usable area is roughly 530 usable sq/ft.